What is it like to spend your youth locked behind bars? Today we talked with Dwayne Betts, who at the age of sixteen was tried as an adult in the state of Virginia for a carjacking. 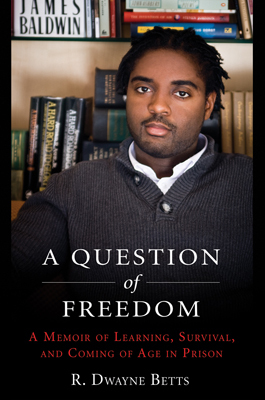 His memoir, A Question of Freedom, discusses his eight year prison term at an adult facility and the many ways that the justice system fails young people. He was joined by Laura Furr, Director of Advocacy Programs for Community Law In Action, to talk to Marc about the problems with the juvenile justice system and how we can reform it. In the second part of the show, we spoke with the director and cast from the Strand Theater’s production of The Mercy Seat. The play, written by Neil LaBute, was one of the first theatre pieces to respond to the September 11th attacks. It’s told from the perspective of a worker at the World Trade Center who was away with his mistress when the towers fell. Danielle Young directed the play, and she joined actors Kasey Arnold and Brett Rohrer to discuss the production. The Mercy Seat opens this weekend.